There is limited research regarding the use of social media or other types of media in online courses. In 2013, I surveyed 110 adjunct professors from a Linkedin group to determine if they added media (including social media) to already developed curriculum. Due to the prevalence of online classes, it might help curriculum designers to determine media preferences. This type of study may also demonstrate the flexibility of online courses, the perception of content requirements in online courses, and professors’ best practices. There was a time when it was unusual to hear about an entrepreneur becoming successful at a very young age. With the technology boom, the story is becoming more commonplace. The following list contains the top 10 entrepreneurs whose dreams came to fruition and made them very rich before they hit the ripe old age of 35. Apple – Creators: Steve Jobs and Steve Wozniak. Apple was established in 1976, the year Steve Jobs turned 21 and Steve Wozniak turned 26. Amazon – Creator: Jeff Bezos. Amazon was founded in 1994, the year Jeff Bezos turned 30. Disney – Creator: Walt Disney. Disney was founded in 1923, the year Walt Disney turned 22. Facebook – Creators: Mark Zuckerburg and his college roommates Eduardo Saverin, Dustin Moskovitz and Chris Hughes. Facebook was launched in 2004, the year that Mark Zuckerburg turned 20. Google – Creators: Larry Page and Sergey Brin. Google was incorporated in 1998 the year that Larry Page and Sergey Brin turned 25. 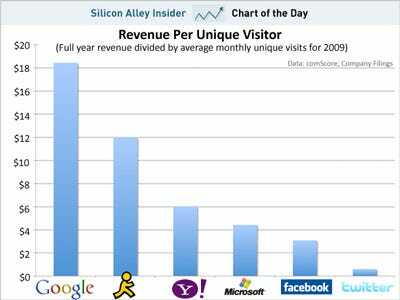 Google’s IPO was in August of 2004, the year the men turned just 31. Groupon– Creator: Andrew Mason. Groupon was created in 2008, the year Mason turned 29. LinkedIn – Creators: Reid Hoffman and founders from PayPal. LinkedIn was founded in late 2002 the year that Hoffman turned 35. Microsoft – Creators: Bill Gates and Paul Allen. Microsoft was established in 1975, the year Bill Gates turned 20 and Paul Allen turned 22. Twitter – Creator: Jack Dorsey. Twitter was created in 2006, the year Dorsey turned 30. Yahoo! – Creators: Jerry Yang and David Filo. Yahoo! was incorporated in 1995, the year that Jerry Yang turned 27 and David Filo turned 29. Click on the company names above to find out more details and top stories about these unique companies. In an article in today’s WSJ.com, they discuss how there is a war going on within the top technology firms to attract the best employees. To read the full article, click here. 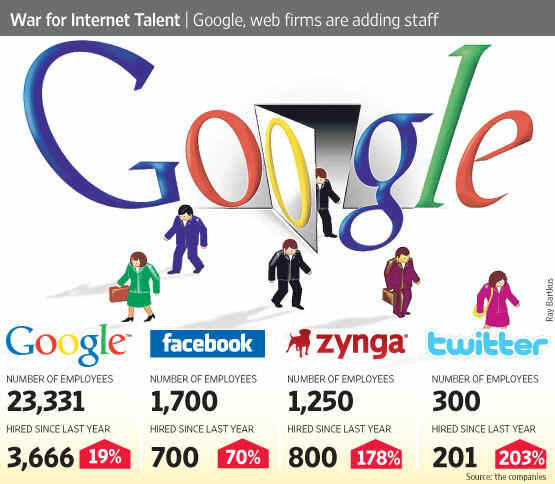 As noted in the picture below, Google has over 23,000 employees, Facebook 1700, Zynga 1250 and Twitter 300. Note that percentage increase in employees is strongest for Twitter with a 203% increase, followed by Zynga with a 178% increase, then Facebook with a 70% increase and Google with a 19% increase since last year.